Maine German Shepherd Rescue View other German Shepherds for adoption. 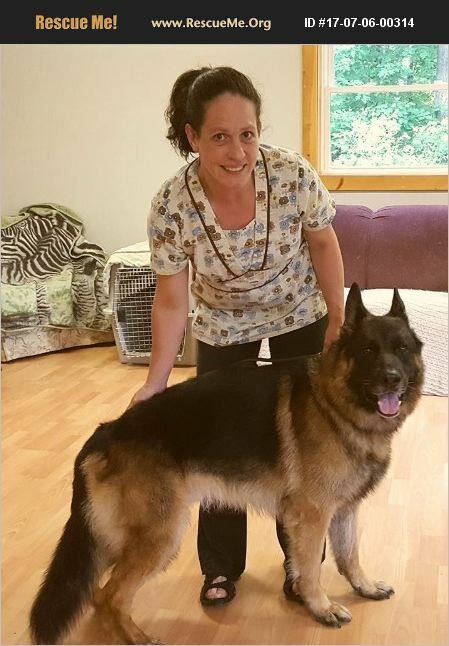 Gunner is a stunning 5 year old AKC registered purebred GSD who came to us as an owner surrender when his owner entered rehab. Gunner had a good life for a couple of years, and even was trained in German. Unfortunately, his owner became a substance abuser, and Gunner's life changed. He was not walked or vetted enough, and rarely left the home. Gunner is friendly, but he does need a strong handler with breed experience, who will commit to Gunner's continued training. He is at a trainer's now getting a refresher course, but he has done what he wanted for several years, so he is strong willed. We will want a home with no small children. Gunner has met kids and is fine, but he is strong as an ox and can be willful, and he is very energetic. Gunner is very scared of things he hasn't experienced, like the vets, and the groomers - he needs to be muzzled in situations like that. The more Gunner explores the world, though, with his new family the better he will be! If you would like to add this amazing dog to your home and heart please fill out our online application at www.miraclegsdmaine.org. We will not schedule meet & greets without an approved app on file. Applicants should expect to have their veterinary references checked to make sure all current and prior pets have been kept up to date on rabies and distemper, have an annual heartworm test, and are on at least 6 mos. of HW preventative per year during the season.